This section details what actions to take if any of the vOneCloud appliance configuration functions fails. 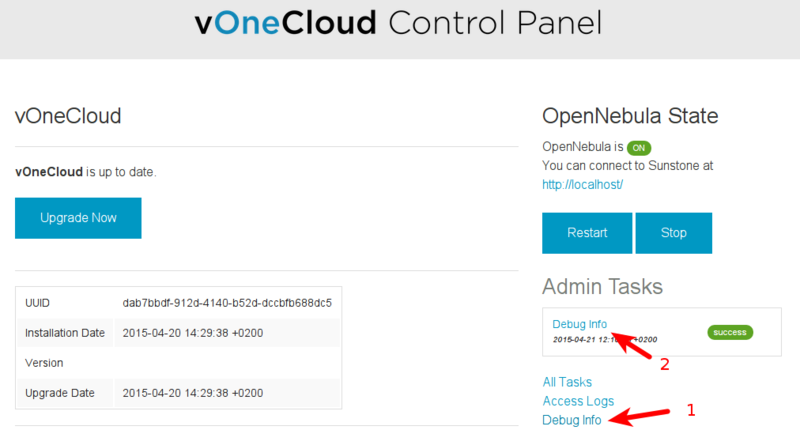 OpenNebula Systems vOneCloud Repository is unreachable. Cannot check for upgrades. Read the Troubleshooting guide for more info. If you are not using a proxy, make sure you can reach the Google DNS to test internet connection: ping 8.8.8.8. If you are sure the network is properly configured, please feel free to submit a support to vOneCloud Support. An Admin Task called Debug Info generates a gzipped tar file which can be downloaded that contains all the required information to debug the cloud if the OpenNebula user runs into a problem. This file can be then sent to vOneCloud Support. Note that this sends information on all the resources of the cloud and the OpenNebula log. Please examine this information before sending it over if you have concerns about sensitive data that might be automatically bundled in the file. A job should never fail. If it fails you should submit a support ticket with the attached Job Crashed Report (link found in the Job page) to vOneCloud Support.